One of the most visible parts of this year’s Infecting the City Festival, is Slices of Life at the Festival Hub in the Station Forecourt. Here eight artists from Cape Town and Johannesburg are transforming recyclable garbage into artwork, with the purpose of drawing attention to valuable materials that most of us consider to be ‘rubbish’ and subsequently dispose of. 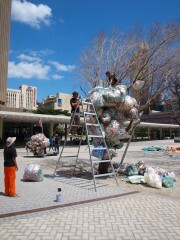 Since Monday, the artists have been busy converting garbage – which has been collected from 200 Cape households in five different communities and gathered into 20 piles – or “Slices of life” – into art. 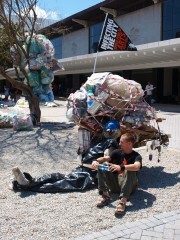 Cape Town based artist, Simon Max Bannister is focusing on how our over-indulgent lifestyles create excessive amounts of garbage. “To make a change we must all learn to reduce, reuse and recycle our waste,” he says. In one of his artworks, Bannister has overloaded a shopping trolley with rubbish, placing its collector and recycler, (sometimes also viewed as disposable), next to it. With this Bannister wants to show that one person’s waste is another’s treasure. Another artwork in progress is a tree that is being transformed into a face, showing different sides to what we call ‘rubbish’. Make sure to drop by the Station Forecourt within the next few days to visit Slices of Life. This entry was posted in Culture, Design, Green. Bookmark the permalink.